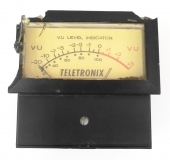 Teletronix UA UREI LA-2A Original Beede VU Meter Works Well But 1" Crack #3. 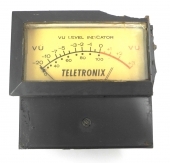 Teletronix UA UREI LA-2A Original Beede VU Meter Works But Damaged Cover #1. 10 Exact Replacement 1/4" Long 6-32 Hex Head Screws For All UA 1176LN, LA-3A, Etc. 3-Gang 3-Station 8PDT Schadow Type Interlocking Switch Assy. For Eventide Etc. 2-Gang 2-Station 8PDT Schadow Type Interlocking Switch Assy. For Eventide Etc. 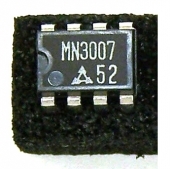 NOS 50UF @ 475V / 40UF @ 475V / 40UF @ 25V Can Capacitor. NOS Kemet BH ALP20A103CB016 10,000UF 16VDC4-Terminal Vertical Electrolytic Capacitor. 2 CDE Long Life Power Grade Axial 1300UF 75VDC 105C "Laydown" Electrolytic Capacitors. 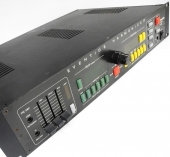 Large Binder w/Many Large Schematics & Docs For EMI Redd 37 4-Track Mixer. Qty. 33 UF 150VDC CDE Cornell Dubilier Paper Sleeve Axial Electrolytic Capacitors. Guaranteed. NOS Sprague Atom TVA 1423 200UF 150VDC Axial Electrolytic Capacitor. NOS Replacement UA 50-0005 Power Supply Regulator PCB For 2-LA-2. Unused Mallory 40uf / 20UF / 20UF 450VDC FP Twist Lock Can Capacitor w/Phenolic Wafer. Reformed, Tested. Dings, Poor Cosmetics. Unused Mallory 40uf / 20UF / 20UF 450VDC FP Twist Lock Can Capacitor w/Metal Wafer. Reformed, Tested. Dings, Poor Cosmetics. New 7-Gang Input/Output Barrier Strip For UA UREI 1176 1176LN Versions A-F.
NOS Unused Harris Hughes HLCD0438AP 40-Pin DIP LCD Driver IC. Otari 5 Amp Circuit Breaker. 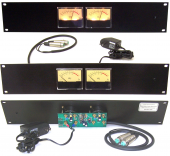 NOS 4-Pole 4PDT Latching Isostat Switches For Neve Consoles, Etc. 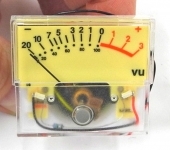 Original Modutec VU Meter, No Logo, For All UA UREI 1176LN LA-3A LA-4 Blackface Models. Original Reticon R5101 2K Bucket Brigade Analog Delay IC. NOS Original Panasonic MN3007 8-Pin DIP 1024 Stage Low Noise Analog BBD Delay IC. NOS Sylvania 24 Volt 80ma Plug-In Incandescent Cartridge Lamp, Clear Lens 33mm x 7mm.